Sardar Patel Stadium aka Motera Stadium is one of the premier cricket stadiums of India. It is located in the Motera locality of Ahmedabad. The old cricket stadium at Motera had a capacity of 54,000 people but last year Gujarat Cricket Association’s handed over it expansion and renovation project to Larsen & Toubro Company. The newly build Sardar Patel Gujarat Stadium definitely a dream stadium for all cricket lovers around the world. The new Stadium can accommodate 110,000 fans surpassing the World Largest Cricket Ground Melbourne Cricket Ground which can accommodate 100,024 fans. 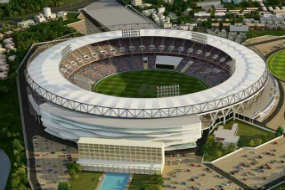 The New stadium acquire 63 acres of land and equipped with all modern facilities that International stadiums can have. The total cost of the project is Rs 700 crore. The stadium have 76 corporate boxes, four dressing rooms, a club house and an Olympic-size swimming pool apart from this, parking capacity is also increased now it can hold upto 3,000 cars and 10,000 bikes.